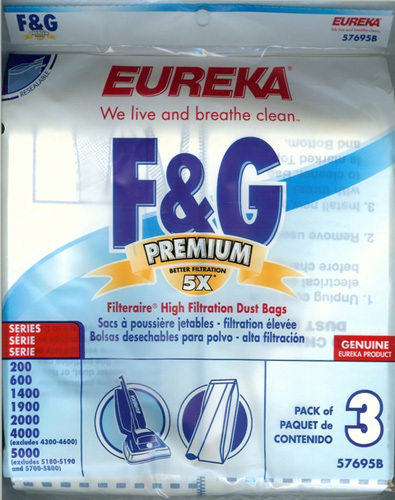 Eureka & Sanitiare Style F&G Premium Filteraire Bags 57695. Fits Series 200, 600,1400,1900,2000,4000 (excludes 4300-4600),5000 (excludes 5180-5190 and 5700-5800) Upright Vacuum Cleaners. Also fits Sanitaire System Pro S634 All; S647 All; S670 series A, B, or C; S677 series A, B, or C, SC888 All; Commercial Upright Vacuums. The micron filtration system retains up to 100% of dust mites, grass and ragweed pollen plus particles 15 smaller than the diameter of a human hair. Filteraire bags filter 5 times better than standard dust bags.